We suggest listening to Tam Dalyell in our Audio Archive, concerning the dilemma of Britain’s Foreign Secretary Francis Pym, over 1st-2nd of May. When Pym arrived in Washington on the evening of May 1st, he claimed that there was no intention by Britain to do anything except enforce the Exclusion Zone. But, the very day before he had been present at a War Cabinet meeting that had authorised the sinking of the aircraft carrier outside of the exclusion zone. (Ponting, p.54). 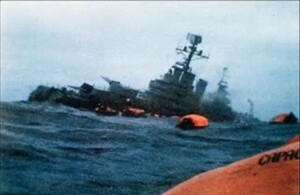 He and Britain’s Attorney General had then drafted a memoir to the PM questioning its legality under international law (and Article 51 of the UN) saying it would be important to first give warning to the Argentine government, of an intention to sink the aircraft carrier wherever it was. The warning would be that the Carrier would have to remain ‘within the narrow zone we discussed yesterday’ to be safe.’ He presumably expected notice to be taken of this memo, which was why he could give the assurance he did to Haig upon arriving in Washington. But, Pym was informed of the Sunday lunchtime decision ‘sink anything’ in a telephone call made 13-14 h GMT, or 9-10 am Washington time, ie just prior to his meeting for breakfast with Haig. ‘And in spite of this he is reported as telling Haig that no further escalation was imminent!’ (Diana Gould, p. 74). Following this meeting, Haig receives confirmation from Peru that Galtieri has accepted the peace proposals, and rings Pym at the British embassy. Pym declines to take the call and instead instructs Henderson to call Haig back – on grounds of his flight to New York! Gavshon & Rice: ‘he could not call knowing that destruction of the Belgrano was imminent ..There can be little doubt that if he learned at that crucial moment the British were about to mount a major operation Haig would have hit the roof. Pym, a seasoned politician, would have known that.’ FAC31.. He declined to take ‘a telephone call from Alexander Haig emphasising the importance of the Peruvian proposals which they had discussed during their morning session’ – because of what he knew, ‘the burden of his knowledge of the military escalation that was about to occur in the south Atlantic’ (RA, p.65). Shockingly, Pym told Panorama: ‘There was no actual piece of paper with a text being altered – there was nothing like that.’ 16.4.84, (FAC, p.37) and his Memoirs make no allusion to the whole affair. Costa Mendez felt obliged to denounce this memory of the British Foreign Secretary because it was ‘so far from the truth.’ He wrote, ‘President Belaunde of Peru said on the telephone to President Galtieri in the early hours of the 2nd, “This is the text that has come out of a conversation in which the secretary of State showed that he very much wants to be able to take something concrete to his dialogue with Mr Pym tomorrow” and later on stated: “before 10 tomorrow morning, when the secretary of State is going to have discussions with Pym, it might be possible to gain some agreement about these points of view”.’ And later at 11 in the morning of the 2nd added, ‘look, the American Ambassador has rung me and put to me two very small matters.’ (FAC p.171, translating the article 18.4.84 from Clarin, Buenos Aires).